Teaser Trailer For Our New Game! Watch our brand new teaser trailer for our next game! The game is set to release for mobile this spring and will showcase some very exciting gameplay we haven’t tried before. Don’t forget to follow our Insta If you want to get behind the scenes of our development. Very excited for this one. Loving the smoothness and graphic style. When will smash hit game update arrive? When will it arrive for the smash hit update? We all love smash hit game and we all want new levels to this game. Well,I’ve got an idea for the level 12 of smash hit.It’s on the comments of <>. Smash hit update coming soon? Smash hit update coming soon ? Level 12,13,14,15,16,17,18,19…. ComingSoon ?We want answers!!!!!! I worder what the teaser for Does Not Commute coming out? Soo exited for the new game!!! I’m sorry half of the comments is about Smash hit. I just wanted to say that it looks very nice and laid back. It’s nice to see a mobile deceloper who understands that you don’t need to be loud and flashy to make good and successful games. Based on the teaser you drive a car and when you meet an objective (not shown) you drive another car, but the car you drove last time is still existent and drives the same route as last time, keep repeating until you crash? This is going to bring some havoc fun. 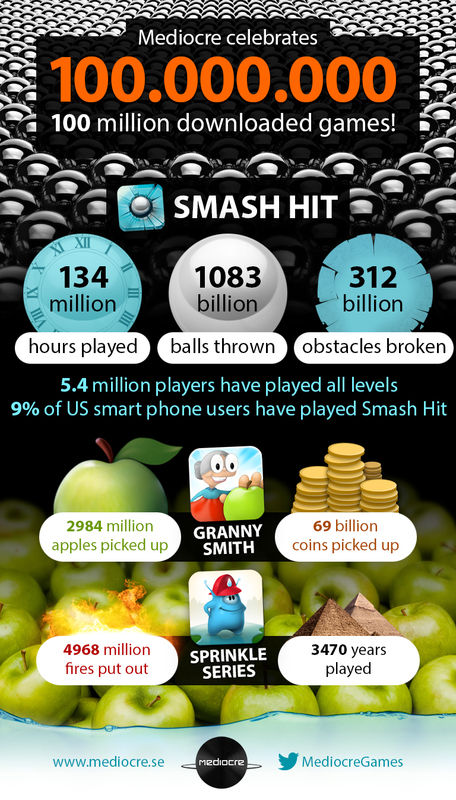 Smash Hit In the App Store Best of 2014! 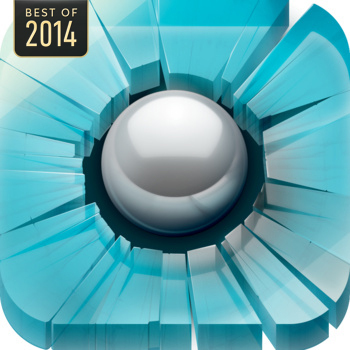 We’re incredibly happy to share with you that Smash Hit is selected by Apple to be included in the App Store Best of 2014! This is such a great honor! Overall this year has been a very exciting one, and Smash Hit has broken all our previous records and expectations. A big thanks to all who took their time to play Smash Hit, who shared it with their friends, liked our Facebook page or reached out to us on Twitter. Thank you Douglas Holmquist for perfecting the game with your awesome music. A big thanks to all players who took the time to share feedback and write reviews! Without you all this wouldn’t have been possible! Remember to check out all the App Store Best of 2014 games for your iPhone or iPad. This is, by far, the most incredible game I have ever played! Wish there was more of it. Seriously! Made it all the way to the infinty level , now I just go white after a few seconds…game is still running because I can throw balls? Cant even go back to earlier levels…the same thing happens. I wish that there will be more levels coming soon for smash hit. We want more levels to play!!! I bought the premium and guess what, I cannot play it. I already been charged but I don’t have the premium in my iPad….I tried to restore the purchase but that didn’t worked out. What a rip off. why does this game cant to save ? Ok, forget what I said about premium not saving. I just found out that when you see ‘start’ you can swipe right to left to see the saved levels. Paid for premium. Worked until I switched off my phone. The next time I switched my phone on there was no longer the premium I had paid for. The suggestions in the FAQ to click on “restore purchase” didn’t do anything. I want my money back. Please, please, please shorten the diststance between the checkpoints. I hate running through the same barriers a thousand times without getting a chance to reach the next doors. I thoroughly enjoy Smash Hit on my iPod Touch and wonder why there isn’t a Mac version? Smash Hit is built to be played on a touch screen. With touch screens not prevalent on the Mac/PC platform the game would need a massive overhaul to properly function. As of today we can proudly share with you that our games have been downloaded (at least) 100 million times! This is huge, almost too big to fully comprehend! To help you grasp what this means in numbers we’ve put together a small infographic for your viewing pleasure. Feel free to pass it around or share it with your friends. The majority, around 70% of the downloads, are from our latest game Smash Hit. The Sprinkle series are approximately 20% and Granny Smith 10%, so it’s safe to say Smash Hit has indeed been living up to its name! We’re also thrilled to see that 5,4 million players actually made it to the endless mode of the game. We’re still determined to stay small and focus on projects that we enjoy working on. Staying small also allows us to do games that are just fun and enjoyable, without any financial pressure to monetize our games aggressively in order to maintain our studio. To celebrate all of this we’re throwing a party for our friends this Friday. Let’s hope we remember to snap some photos and maybe we can share them with you later on. A big thank you to all of you who have downloaded and played our games. Without you this wouldn’t be possible! When will levels 12 and 13 for smash hit will be out? Please make another artistic gorgeous game like Smash Hit. It may be more work, but by Gawd it TOTALLY stands out from the crowd. Kudos! Reviewed it everywhere to spread the word. Bored by granny & driving, sorry. Hey, does anyone know Henrik’s high score on Granny Smith? I beat Dennis’s already, so this is my last achievement on Game Center! I really wish I knew what his high score is, and which level to beat it on! no updates since 2013 for granny smith?? abandoned game and no worth for buying? No updates doesn’t mean the game isn’t worth playing. Still works well and is a lot of fun to play. Hi there! We just wanted to let you know that it’s now possible to subscribe to our brand new Mediocre newsletter! This is perfect if you want to stay up to date with what’s going on in our studio, our new games or updates. The newsletter will only be sent to you on special occasions and you can be sure your email is safe with us. Click on the “Newsletter”-tab on the top of our page and fill in your name to get started! When will levels 12 and 13 come out? Guest Post: How The Smash Hit Soundtrack Was Created! Where the magic happens! 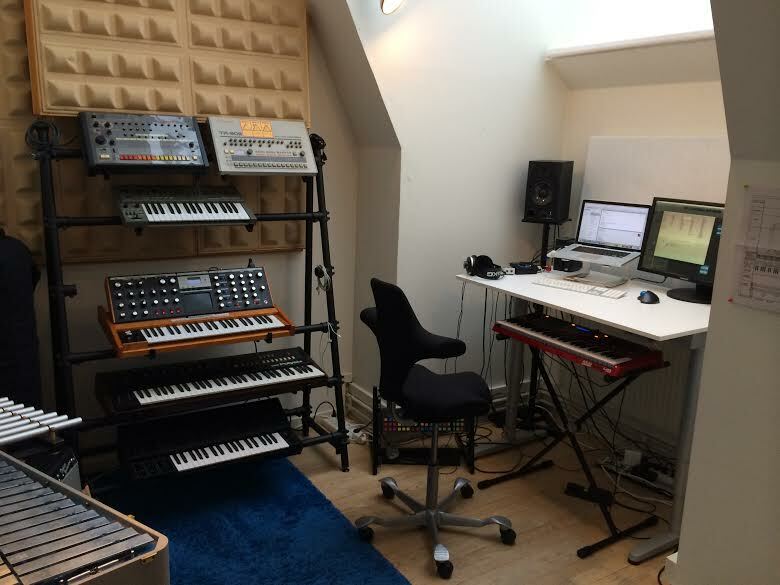 This is where Douglas composes his music and sound effects. Since Smash Hit was released in March 2014 we at Mediocre have received tons of emails and messages asking us about the music featured in the game! It really seems like you guys are loving the tracks our composer Douglas Holmquist wrote for the game. Today’s post is guest written by Douglas and was originally published on his Bandcamp site. Douglas is also the mastermind behind the music featured in our previous games like Granny Smith and the Sprinkle Series. But enough about us, here’s a piece by Douglas explaining the challenges and process of creating Smash Hit’s soundtrack! Writing the music for Smash Hit was probably the most challenging of all the games I’ve worked on with Mediocre. And in the end definitely the most rewarding. Because of the enormous reach of the game, my music has been heard by millions of people that would have never heard it if it wasn’t in a game. A game that, thankfully, lived up to it’s name and became quite a smash hit indeed. And i’d like to think that the fact that we really worked hard on getting the music and sound design to fit the game really paid off too. I’m very happy for all for the kind words I’ve received through e-mails, Bandcamp, Soundcloud and other places. And equally humbled by album downloads, spontaneous remixes, and questions from fellow producers regarding the inception of the music. So I thought I’d write a little something about that. Dennis and Henrik started working on what would become Smash Hit sometime during the fall of 2012, and I joined in sometime in January 2013. They knew right from the start that they wanted the music to be electronic, and that the style of the game would differ a lot from earlier Mediocre games. It took a while while for me to find the right style, partly because of the fact that we worked on Sprinkle Islands at the same time, and partly because Dennis and Henrik were quite particular about the music. Something I’m very thankful for, cause their feedback, ideas, references and the discussions we had made it all so much better in the end. I did the first couple of sketches in February. They were based around heavily processed drums, some ambient synth chords and some melodic arpeggio stuff. Dennis had suggested that the music should be divided into 24 second parts in 120 bpm, and that all parts should be able to be played in any order and still make musical sense. I tweaked the sketches for a bit, but then we decided (thankfully!) to move on in an another direction. Dennis and Henrik presented a couple of reference tracks, (Shigeto – Look at all the Smiling Faces, Gold Panda – Fifth Ave, Robot Koch – Water and Solutions, to name a few) that all had features they wanted for the music, big sounding spacey reverb, interesting drum programming, warm analog sounding sampled beats, a bit of static, and some heavier beats and analog synth stuff as well. After a while I presented a second batch of ideas, and this time we all felt that we were going somewhere, and I still think that there are some really nice ideas in there. After that, some time in March, I put the Smash hit music on hold, and focused on finishing Sprinkle Islands. I picked it up again after the summer, and the visual style of the game had really started to fall into place. Here was this beautiful, clean, sci-fi aesthetic that needed a soundscape to match the way it looked. Even though we all liked some of the elements from the last couple of sketches, I started over and came up with the minimalistic ambient track that later became the beginning of the track Start. By now the music was ordered in sections of 32 seconds, with 2 second intros and outros that made the mixing (all done in Dennis’s custom built software mixer) between sections smoother, and the transitions more interesting. Musically, I moved away from the sampled sounding beats, the fuzzy warm analog synths and the static, and developed a brighter, cleaner, slightly more digital sound. 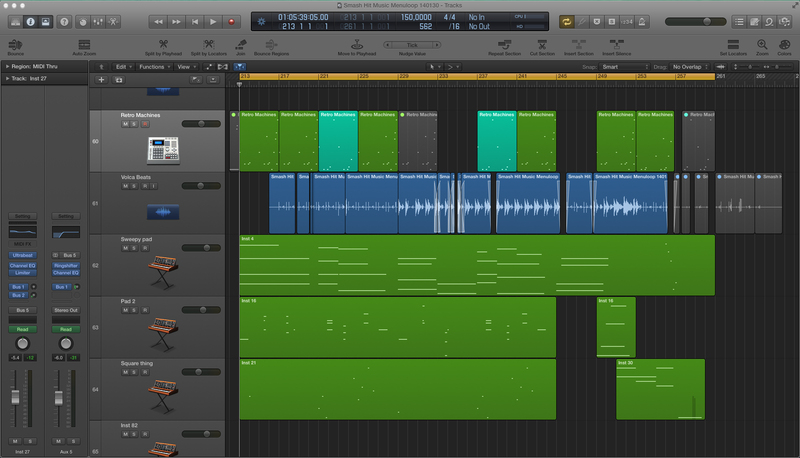 I have been working in Logic for a number of years, and during the summer a new version, Logic Pro X, had been released. 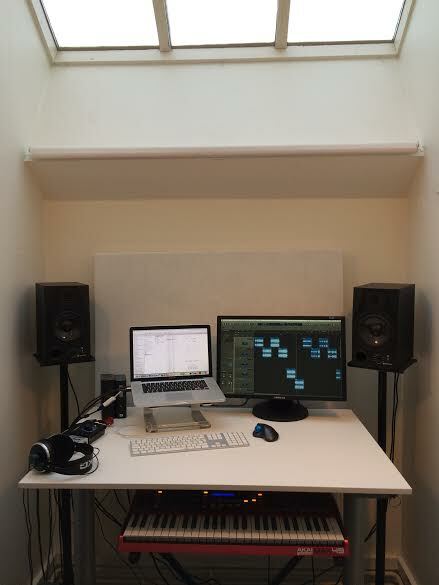 I really love the feeling of how new instruments, new software, new speakers or whatever, can give you instant ideas, and make you want to experiment. In this particular case, I really fell in love with the Retro Synth, that while emulating an analog synth still was so much cleaner than my beloved Moog, Roland and Korg analogs that I had used for the sketches I made in March. 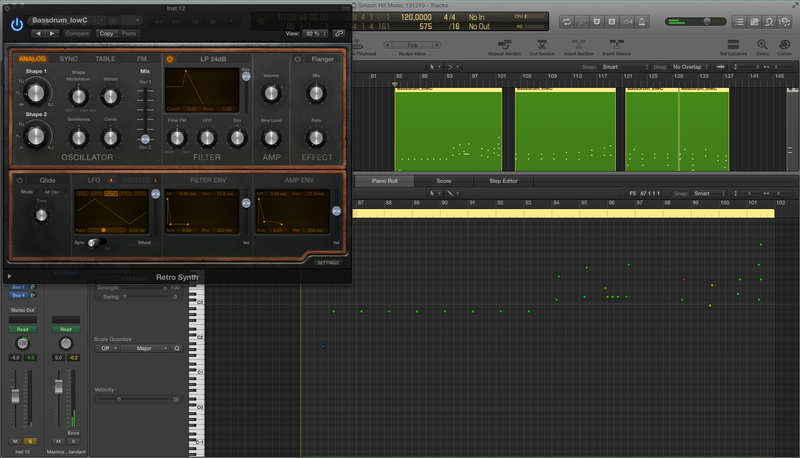 So Logic X’s Retro Synth became the foundation for the Smash Hit sound. I also used the arpeggiator and the ring shifter a lot. For drums, I started putting together a drum machine pallet consisting of some of the sounds from Ultrabeats’ Retro Machines and some 808-like tom and conga sounds that I made with the Retro Synth. I put some ring shifter on some of the shaker and hi hat sounds to get that stuttering drum sound that Everything But the Girl used a lot ion Walking Wounded, and that sounds soooo nice with a big reverb… I then stuck to this rather limited drum pallet (which the exception of the Korg Volca Beats that I bought near the end of the production and used in a few places) to get a coherent sound. With the unlimited drum samples available in today’s music software, it’s easy to get lost just browsing for cool sounds, instead of developing something that gives the music a sense of one-ness. A lot of people have asked me whether the beginning of Start is influenced by Boards of Canada. As much as I love them, and as much as they’ve probably influenced me on different levels, in this particular case I have to say that the inspiration comes more from the track Televised Green Smoke by Carl Craig. I love the sweeping ambient synths, the 808 toms and the hi-passed squeaky arpeggio, and the overall sci-fi cleanliness of the track. And I think all of those elements are present in different parts of the Smash Hit soundtrack. Creating the soundtrack for Smash Hit was a complex process, but it was a very rewarding project. The photo shows some work in progress with 808 toms. The fact that I’ve mentioned two tracks from the 90’s as inspiration and the fact that two of my most used instruments have the word ”Retro” in them is probably significant. While I wanted the soundtrack to feel sci-fi and modern and clean, I still wanted some sense of nostalgia in the music. And Dennis and Henrik were on the same path with the look of the game. Tron (and Tron Legacy) was referred to quite bit. Once I had gotten the first few 32 second pieces of music together, and gotten thumbs up from the Mediocre guys, the production of the music accelerated fast, and by the end of the year I had about 30 pieces ready. I worked on the sound design – the breaking glass, the ball sounds and so on – in parallel with the music the whole time. After the holidays, I made another couple of pieces and the menu music, and did some tweaking to the previous bits. My first idea for the menu music was to have something extremely sparse, almost just a low noice and some very subtle sound effects and synth sounds, so that there would be a huge contrast to the in game experience. But after trying that out we realized it felt kind of boring… So I wrote some menu music based on sounds I had used in the in game music, but made very sure to set it in a different tempo than the in game music (which is all 120) to set it apart in that way. I also wanted the menu track to have both the rhythmic and ambient qualities of the level music, albeit being a bit more free rhythmically. Photo showing work in progress for the Smash Hit theme music. The game was released in March and by then it had 33 pieces of level music, stitched together in different combinations. I would like to give some credit to Dennis and Henrik for combining the parts of the music in ways I would never have thought of. For me, the process of making the music became quite linear – one track leads to another, similar sounding track, that leads to another and so on. Even though we had established quite early that we were going to need a big variation between the parts – from really ambient to more driving techno/house drum patterns, to half time beats, straight, shuffled, 4/4, 12/8 and so on – it’s sometimes good to have someone other than yourself to make sense of what you’re doing, and rearrange things for you. For the May update I made seven more pieces of music, and for the game modes update I made three versions to the theme music. The early music sketches are available at my Soundcloud page. I hope you had fun reading this and perhaps learned something new for making music and sounds for video games! Really excellent music. I have recommended this game purely on the soundtrack. Love seeing the process of how a project comes together thanks for sharing. Hey Douglas, can I remix the badass tune that plays in Checkpoint 2, Zone 3? I’ll forward your question to Douglas and let him reply himself.